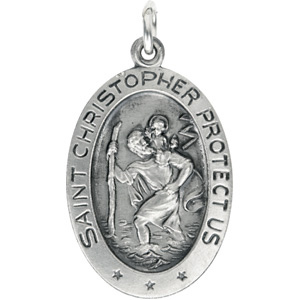 This St. Christopher Medal with Out Chain available from CatholicShop.com features dimensions of 21 X 13 millimeters, approximately 7/8-inch by 1/2-inch. 2" Franciscan Tau Cross with Cord. This 2" Wood Tau Cross On Cord features the CatholicShop.com money-back guarantee. By G.K. ChestertonThe most insightful book about Francis of Assisi—ever. Ideal for gift-giving, thisbeautiful edition offers all of G. K. Chesterton's insight, humor, and wit as he uncovers the real meaning of the life of the world's most popular saint. All [Francis's] life was a series of plunges and scampers; darting after the beggar, dashing naked into the woods, tossing himself into the strange ship, hurling himself into the Sultan's tent and offering to hurl himself into the fire. In appearance he must have been like a thin brown skeleton autumn leaf dancing eternally before the wind; but in truth it was he that was the wind. The conversion of St. Francis involved his being in some sense flung suddenly from a horse. There was not a rag of him left that was not ridiculous. Everybody knew that at the best he had made a fool of himself. The word fool itself began to shine and change.